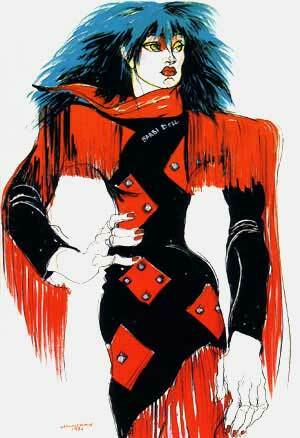 'Barbi Doll' Painting by Jo Brocklehurst. In 1982, the artist Jo Brocklehurst, who was best known for her powerful drawings of punks and the club culture of 1980s, did a series of paintings of Barbie. 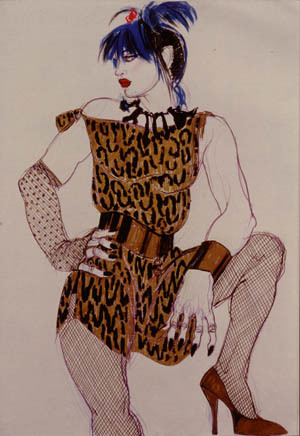 Jo Brocklehurst worked as a fashion illustrator early in her career, though she disliked being described as an “illustrator,” preferring the terms painter or draugtsperson. During the 1960’s she sketched jazz musicians, including George Melly, though her work was not widely recognized until the 1970’s and 1980's. A year after Brocklehurst was featured in her first solo exhibition in Amsterdam 1979, she made a major breakthrough at the Institute of Contemporary Art exhibition "Women’s Images of Men." 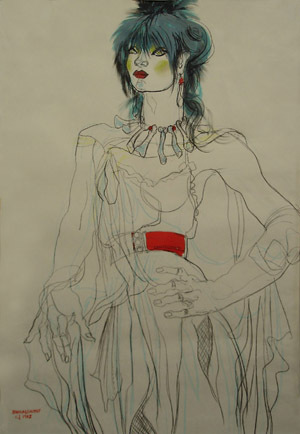 Her work soon became widely recognized in the United States and Europe, and was compared by more than one critic to the work of Austrian artist Egon Schiele. Brocklehurst traveled widely in Europe and the United States, making extended stays in Paris, Rome and New York. She frequently drew on site in dim nightclubs, where she captured images of artists, disc jockeys and the clientele of exotic clubs in London and Berlin.